Students majoring in Social and Cultural Sciences (BA) have to arrange with Nicole Klück (Department of International Affairs, AM 209) the courses they would like to take at universities abroad to verify if they are recognizable. Tip: The answers to many questions regarding recognition can be found in the FAQ. Form A (Recognizability of abroad-earned credits) is to be filled out and to be sent via email to Nicole Klück. Personally arrange with Nicole Klück the recognizability of courses during her office hours or via email. ATTENTION: Please note her office hours! Please orient yourself through the courses that were offered at the partner university during previous semesters. Up-to-date course catalogues sometimes can still not be found on their homepages. 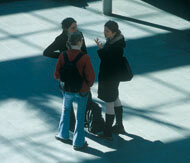 Course changes can still be made during your stay abroad. In order for your stay abroad to be recognized in accordance with § 8 of the "Fachspezifische Ordnung des Bachelor of Arts Kulturwissenschaften" (22.10.2014) you need to complete at least one course which will be recognized with at least 6 ECTS credits. Should there be course changes during the beginning of your stay abroad, Nicole Klück should be advised of them via email. A filled-out version of Form B (Application for the Recognition of Abroad-earned Credits) for BA students majoring in the Social and Cultural Sciences, or a filled-out version of Form B (IKG) for BA students majoring in Intercultural German Studies. Please note that Nicole Klück is responsible for the recognition of Bachelor students. Master students can get their credits recognized from their respective program heads or coordinators.